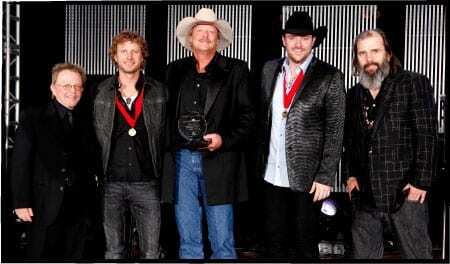 ASCAP did a reboot of its country awards on Tuesday (9/14). Rather than placing its date next to the Nashville Songwriters Hall of Fame banquet—or anybody else—the organization elected to stage a stand-alone ceremony. Which is fine with those of us who face multiple deadlines. For the first time, the event was held at War Memorial Auditorium and on its plaza. For this 48th annual celebration, drinks and dinner were served in a (somewhat warm) plaza tent. The meal was done buffet-style, featuring pasta dishes, seasonal vegetables, chicken, beef, breads, olives and a cheese course. Then, in reverse order of recent ASCAP fetes, came the music and the awards. We were herded inside the War Memorial and given Fiji Water bottles. Goody, it’s the brand I already drink. “Steve Earle made me sound cool for a minute there,” said Alan. He also mused that he should have saved “Wanted” to pitch to Chris, who sang it so well. “I’m very honored and very humbled,” added Alan. Brett was dressed in a stylish black velvet jacket. As is customary, this gala had glamour. Invitations read, “creative black tie,” and many were garbed just that way. Richard Young chose a dark denim shirt with a beaded bolo tie. He says he has seven songs ready for the next Kentucky HeadHunters CD. The group still tours constantly. Gary Burr and Wayland Holyfield wore black-on-black shirts and jackets. Angelina Presley was a dish in a roses-print frock. Tom Roland wore pin stripes. Erika Wollam-Nichols was fetching in floor-length ebony. Joey + Rory arrived in cowgirl boots and overalls, respectively. Bucky Covington chose a pale blue t-shirt, jeans and a trim black jacket. Kellie Pickler wore a scalloped and sequined cream-and-black mini cocktail dress with a wide black belt and sky-high stilleto heels. Love & Theft were colorfully garbed. Hillary Lindsey was in a white, Grecian-draped, off-the-shoulder cocktail dress. Craig Wiseman wore a black sequined shirt instead of a Big Loud one. Jonathan Singleton was in a dressy vest with sporty tennis shoes. Darrell Brown chose worn blue jeans and a gray jacket. Jason Sellers had on a sleek silver shirt. Carla Wallace was eye catching in a figure-hugging crimson satin, knee-length dress. Chris Stapleton’s beard and long hair were topped with a tan cowboy hat. Brett Jones was in a white, tails-out western shirt. Barry Coburn wore a metallic blue tux jacket. Turning heads everywhere was Liz O’Sullivan in a floor-length, strapless shimmering blue evening gown. Others arrived with news rather than fashions. Robert Ellis Orrall, for example, has the farewell Judds single. Pat Alger is being inducted into the Nashville Songwriters Hall of Fame next month. Don Schlitz is being presented with the ACM’s Poet’s Award next week. Jerry Bradley is back on the scene, looking remarkably well. Victoria Banks was fresh from the Canadian Country Music Awards, having won both the Female Vocalist and Songwriter prizes. Marc Beeson has a new CD, as does pop princess Alyssa Bonagura. Steve Williams was celebrating his new FAME job. Beverly Keel was freshly minted as a Universal exec, and it was kind of fun watching her having to introduce herself to her own artist, David Nail. Merrily mixing and mingling were fabulons Radney Foster, Gloriana, John David Souther, Will Byrd, Jimmy Webb, Tree Paine, Roger Murrah, Amy Kurland, David & Carolyn Corlew, David & Karen Conrad, David & Susana Ross, David Ewing & Alice Randall, Doug Johnson, Doug Howard & Linda Edell, Denise Stiff and Garth Fundis. We gabbed in the evening air alongside and/or with Bobby Rymer, Ron Stuve, Rivers Rutherford, Kay West, Ronna Rubin, Jo Walker-Meador, Bob Doyle, Katie Gillon, Adam James, Barbara Cloyd, Deanna Bryant, Ken Levitan, Mark Ford, Hal David, Roger Greenaway, Trent Willmon, Chris DuBois and Anita Hogin.